When No. 10 UCF takes on Memphis at Liberty Bowl Memorial Stadium on Saturday, it will be the Knights’ first road game since Aug. 30. After having a longer-than-expected stretch of home games due to the impact of Hurricane Florence, UCF (5-0, 2-0 AAC) is looking forward to hitting the road again this week. The two teams are facing off for the first time since their meeting in last year’s AAC Championship Game, a contest won by the Knights, 62-55, in double overtime. The Tigers (4-2, 0-2 AAC) finished 10-3 in 2017, with two losses coming in Orlando. With their home crowd behind them, they’re itching to get some revenge on the defending champions. Memphis was once again voted as this year’s favorite to win the AAC West, but its start to conference play hasn’t gone as expected. The Tigers lost games to Navy (22-21) and Tulane (40-24), but they still represent UCF’s biggest challenge to date. The Tigers are No. 6 in total offense (547.2 yards per game) and No. 8 in rushing offense (274.5 yards per game). Henderson leads the nation in rushing yards (934) and yards per carry (11.8) while sitting in a second-place tie for rushing touchdowns (12). Henderson isn’t the Tigers’ only weapon. He’s not even the only weapon in the backfield. Fellow junior Patrick Taylor Jr. has 337 yards and six touchdowns of his own. Henderson and Taylor have allowed for an easier transition at the quarterback position. With Riley Ferguson gone, coach Mike Norvell decided on redshirt junior Brady White as his next signal-caller. White has adjusted well, throwing for 1,549 yards and 15 touchdowns to just one interception. His completion percentage of 69.2 ranks him No. 13 in the country. Davis is the reigning AAC Defensive Player of the Week after totaling six tackles (three for loss), a sack and a forced fumble in last Saturday’s win over SMU. The UCF defense has allowed just three total touchdowns in the last two games. It is allowing just 17.4 points per game this season, which is the 20th-best mark in the nation. The Knights are fifth nationally in tackles for loss with 47. 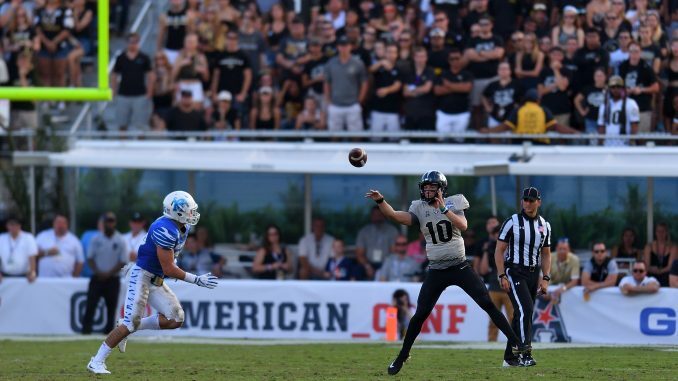 On the other side of the ball, junior quarterback McKenzie Milton still has the offense clicking. UCF ranks in the top 20 in total offense (second), rushing offense (eighth) and passing offense (18th). The run game has been a major part of the offense’s success, both through Milton and his running backs. Adrian Killins leads the team in rushing yards with 346 rushing yards. It isn’t just Milton and the backfield that has kept the offense rolling. Gabe Davis, Dredrick Snelson, Tre Nixon, Otis Anderson and Michael Colubiale have all been reliable for Milton all year long and the offensive line has allowed just two sacks this season, which ties the group for third-fewest in the country. In what could turn into another high-scoring affair, Nixon said the Knights will be ready for whatever comes their way. UCF is 11-1 all-time against Memphis, having won all 11 meetings since joining FBS. Regardless of the long-standing success, Heupel and his team want to stay true to their “attacking champions” motto this Saturday. Kickoff for Saturday’s game is set for 3:30 p.m. In most areas, it will be televised by ABC. In others, ESPN2 will have the broadcast.